﻿ Report from Puerto Rico, by Dewayne and Rita Shappley. Nov. 23, 2010. Eight pages. We are thankful for the privilege of being able to send you this report on our work here, and very grateful for the support, both material and spiritual, you continue to provide. Guided by the information in these pages, we add 40 more conversions through materials prepared here, bringing the Grand Total to 14,076. Two more congregations have been established through the materials, the Grand Total now standing at 245. Needless to say, efficient follow-up work by capable brethren makes many of these fruits possible. With regard to our Internet site, new records have been set during the time covered. Details are in the section “Internet Data”. -El Tigre, Venezuela. Nov. 5, 2010. Bro. Benito Olguín, evangelist in Venezuela, called to inform us he had baptized twenty-nine people in 15 days, in October. He used materials prepared here in Puerto Rico for this highly successful evangelist work. -Rivera, Uruguay. Five baptized. Congregation begun. A few months ago, Gustavo Alsó, of Rivera, Uruguay, contacted us, stating his desire to follow what he had learned on our Web site. Rivera is on the northern border of Uruguay, far from the two known congregations in the south. After a time, Mr. Alsó wrote, stating that he was willing to accept the responsibility of starting a New Testament church in that city. A few days ago, we were pleasantly surprised to receive five pictures of the new congregation. On Nov. 20, 2010, Bro. Alsó sent us the following e-mail. 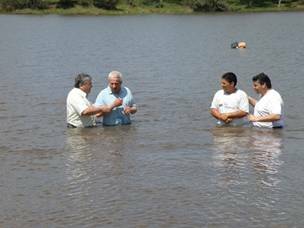 “I inform you that five have been baptized, and four more will be soon, according to the will of the Lord to prosper the church in Rivera. The task of evangelizing here in Rivera is very hard. The sects, with all their economic power, TV, radio stations, lies, etc., are here in this border city with Brazil. We can hardly find someone willing to accept sound doctrine.” Gustavo Alsó. But, through our Web site, we also are in Rivera, as we are wherever anyone has access to the Internet. Rivera, Uruguay. On the left, a meeting place the new congregation has prepared, with the sign above the door reading “Iglesia de Cristo” (Church of Christ). On the right, five men are studying the Bible in a home in Rivera. No American dollars invested here. For $84.90 a month, paid by the Bayamón, Puerto Rico church, thousands of pages of messages, studies, commentaries, guides for Bible classes, etc., are available throughout the world, including information on what is needed to start a New Testament congregation. -Maldonado, Uruguay. 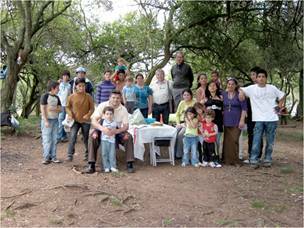 By February of this year, three had been baptized in Maldonado, the original contact for this new work coming through our Internet site. As of the first week of July, Bro. 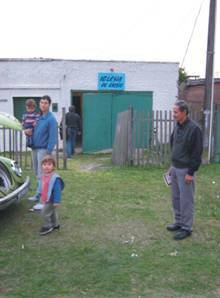 Nestor Peraza, of Montevideo, who is also evangelizing now in Maldonado, found fourteen meeting. “Two more people are interested in being baptized.” E-mail. July 7, 2010. -Arecibo, Puerto Rico. 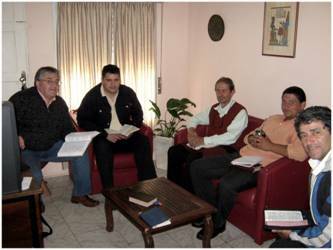 Four conversions through a Bible study published in the daily paper Primera Hora. In the report mailed in June, information was given on the publication of a Bible study prepared in our facilities here. As a result of that project, underwritten by the Bayamón, Puerto Rico church, four people have been baptized in the Arecibo church. Arecibo is on the northern coast, about thirty miles west of Bayamón. In the picture below, Bro. Jim Gillette is baptizing Mr. Nieves, the first to be converted through the publication. Later, Bro. Nieves’ girlfriend and two cousins were baptized. -Colombia. Erick de la Rosa converted through Internet and follow-up. August 27, 2010. E-mail. “Having found this Web Page, I am definitely convinced, more and more, that God has a purpose for my life. For 23 years, I have been a non-active member of the United Pentecostal Church in Colombia. During this time, I learned absolutely nothing, until about five years ago, when God touched my life one morning, and I got up and began seeking answers to my doctrinal doubts. I began studying the Scriptures and slammed against the great, absolute truth of God, being let down by the series of doctrinal errors to which I was exposed for so long a time. I hope to know more of you [members of the church], and be able to build up my own spiritual life, as well as that of those around me.” Erick de la Rosa. We forwarded this e-mail to brethren in Colombia, and just a few days ago, Ronald Sabino confirmed that Erick de la Rosa had become a true Christian. Some Internet contacts state their desire to become members. Others commend the materials on the site. -Littleton, Colorado. Highlands Ranch Church of Christ. July 7, 2010. “I am a follower of your Web Page. It has helped me to grow, as also to correct many doctrinal errors I was dragging along from the time I was an evangelical (Pentecostal and Baptist), a dangerous mixture this one, do you not think?” Gustavo Calderón. Referring specifically to a lengthy exchange between Mr. Tito Martínez and myself on the subject of the Millennium, Gustavo describes it as a “magisterial work of art which the Holy Spirit did through you and your team on the Web page.” Well, I don’t know about “magisterial,” but the rest of the “team” I continually rely on is truly made up of God, Christ and the Holy Spirit, to whom I am eternally grateful for their help in this work. The exchange on the Millennium is a part of the illustrated commentary on Revelation, the present version of which has some over 850 pages. For many years, Tito Martínez, of Spain, has had an aggressive site on the Web. Reading studies on our own site, he accepted baptism for the remission of sins, but when he read an article of ours on the Millennium, he wrote a strong reply from the typical Pentecostal-Evangelical standpoint. It was then we responded, and as far as I know, he has not answered the explanations we made. Let me clarify, that we seek understanding and clear communication, not personal confrontation. -Raleigh, NC. August 5, 2010. Telephone call. After studying materials on our Internet site, Elmer Dunlap’s site and literature from Western Christian Foundation, José Francisco Cheas is now attending an English-speaking congregation in Raleigh. Born in San Pedro de Macorís, Dominican Republic, José is now 63 years old. He had been a member of several Pentecostal churches, and obtained a theological degree six years ago. His profession is that of radio announcer. -Brooklyn, NY. August 7, 2010. José Reyes called; then, called again Sept. 10. He congratulated us on the Internet site, saying: “It has been very useful to me.” This man was into drugs, alcohol and gangs. He converted to Pentecostalism about 6 years ago, assuming at that time, as he said, that all churches are more or less the same. But, as time went by, he began to realize they are not and to see much with which he did not agree. José then began a church on his own house, and has since been in three, or more, other churches. He called to request data on churches of Christ in the New York area and we walked him through our site directory on New York. Guatemalan by birth, he has sent speaker equipment to that country with a view to going there to evangelize. Second call. This time, José informed us he had been studying materials on our site for two years. He repeatedly praised the quality and quantity of materials, observing: “Many, many people need these studies.” By then, he had received the printed materials, CD’s, etc. we sent him, saying he takes them to work with him and that they reinforce what he studies on the site. At that time, he had left Pentecostalism and was worshipping at home. After the second call, we received an e-mail from a trusted brother in New York with whom José Reyes had just made contact, and that brother continued follow-up. -Richmond, VA. August 10, 2010. Carmen Coane, born in Santurce, Puerto Rico, 66 years old, called, saying she wanted to attend a church of Christ. We gave her data, over the phone, on Richmond churches. -Bogotá, Colombia. August 11, 2010. “Hello. My name is Yuly. I am from Bogotá, Colombia. It is a pleasure to greet you. God bless you. I have been looking at your Web Page, and really, it sets forth the word of God. I would like to know where churches with sound doctrine meet in Bogotá. My family and I desire to attend. Thanks for your attention.” We sent Yuly information on congregations in Bogotá. -San Juan, Puerto Rico. August 11, 2010. José Antonio González called, expressing his wish to attend a church of Christ. We gave him information and sent materials. -Syracuse, NY. August 11, 2010. E-mail. “First, I thank God for having put me in contact with you and your magnificent Web Page, which has helped me resolve many doubts, as well as strengthened me in spiritual growth. My name is Magdalena Stetson, and I am a God-fearing person. I write you because you have demonstrated exquisite understanding in your articles. The foundations and truthfulness of each item you write are solidly based in the word of God. I have enjoyed to the fullest almost all the articles and studies you share with sincerity on the Web…” Though Magdalena has evidently been a member for four years, or more, she still had questions about the organization and functioning of the church, some of which we endeavored to answer by phone. -Bogotá, Colombia. August 2, 2010. E-mail. “A thousand thanks for the material rich in teaching. We are studying it at a steady pace. It is exquisite to receive, learn and assimilate.” Aldemar Martínez. We have sent this brother a quantity of advanced studies, including sets of transparences, and he is sharing these resources with others. -Cincinnati, Ohio. Sept. 12, 2010. Telephone call. Federico Ventura stated he had been studying the materials on our site for a long time, finding they contain “pure doctrine.” He expressed the desire to become a member of the church and prepare for the ministry. We put him in contact with the Central congregation in Cincinnati. -Pacific, WA. Oct. 21, 2010. Telephone call by Ramón Romero. Mr. Romero stated he had been studying materials on our Web for months, finding them very useful. When he called, he had already visited an English-speaking church of Christ. We looked for a Spanish-speaking church in the area. Not finding one nearby, Ramón expressed a willingness to begin a Spanish work, saying that others he knows are interested in following sound teaching. We sent him 32 tracts, 19 booklets, 9 books and 8 CD’s. When he received them, he called again expressing appreciation, and noting that materials of that kind are hard to come by. He is disappointed because his wife insists on remaining a Pentecostal. -Yabucoa, Puerto Rico. Oct. 19, 2010. Having studied materials on our site, Denise called Bro. Jorge Ginés, of the Bayamón church. She expressed a desire to attend and was put in contact with the Patillas congregation. -Philadelphia, PA. Oct. 25, 2010. José Calvente called at 10:19 p. m., stating that, after studying materials on our site, he wants “to become a part of our brotherhood”. Mr. Calvente speaks little English, and we have not been able to locate a Spanish-speaking congregation in Philadelphia. We have sent him materials and continue in contact with him. -Bayamón, Puerto Rico. About two months ago, a mother and her two children visited the Bayamón church. Three weeks ago, Guillermo Sánchez, a 28 year old Pentecostal, attended a Sunday night service. Both came through our Internet site. To date, neither has returned. The distance from “Pentecostal” to just a Christian is great indeed. -Kissimmee, Florida. Oct. 26, 2010. Sandro Vargas called, saying he had prayed that morning to find the true church, and that he had found it on our site. We called a Spanish-speaking preacher in Orlando, putting them in contact with each other. -Pensacola, Florida. Nov. 18, 2010. David Jiménez called, stating his desire to attend a church of Christ. We located a Spanish-speaking congregation in the city and have put them in contact. -Guatemala. Nov. 18, 2010. E-mail. “Dear Brethren, I just discovered your Web site and read the subject ‘The Pentecostal Doctrine on the Rapture of the Church Objectively Analyzed in the Light of the Sound Doctrine of the New Testament.’ It is an excellent publication! I am pleased you have freely raised your voice to speak with frankness, without fear of men. It is necessary to proclaim the truth of the word of God, which you do here in an able and wise way.” Abraham Martínez. -Cusco, Perú. Nov. 18, 2010. E-mail. From our dearly beloved brother Hipólito Triveños, who has done evangelistic work, in Spanish and Quechua, for long years, establishing a number of congregations. “Your evangelistic work through recordings, literature and studies is highly important in the face of Protestantism and evangelicals. I want to congratulate all the faithful ministers of Christ for their untiring work of evangelization in the Spanish language.” In years past, we sent rather large quantities of materials to Hipólito. Then, when our son Antonio was working in Peru, we visited him there and he took us to Cusco, where, besides seeing the Inca ruins and going to Macchu Picchu, we spent an unforgettable Sunday with Hipólito, his wife and the church in Cusco. Traffic on the site usually goes down during the summer months, and that happened in June, July and August. Then, new records for use of the site were set in September and October. The one million mark for visitors in 2010 was reached in early August. Last year, that same mark was reached in November. As of 3:12 p. m., Nov. 23, a total of 1,553,315 visitors had been registered for 2010. This data is provided by www.web.com, our Internet provider. It is updated about every thirty minutes. When evaluating the site, keep in mind that the number of “Pages Opened” is probably the best indicator. We note that 319,187 “Pages” were opened in October. “Pages” covers all documents or files on the site, including the Home Page. With regard to evangelization and edification, there are several different subcategories of documents on the site. I estimate the equivalent number of letter-size, printed pages to be above 4,300. One of these days, I must print out all the documents to come up with a more specific amount! Suppose we should try to print, in one single month, 319,187 Pages (documents, files), many of them in full color and quite a number many pages long, then, pay the postage to send them to points all over the world where at least some speak Spanish, including Europe and Asia. What would be the labor and cost? Thousands and thousands of dollars! And a tremendous amount of time would be required for such a task. Most people who are given this information seem amazed by the number of visitors we are receiving. A religious site, in the Spanish-speaking world, with this number of visitors! All visitors are exposed to the site in one way or another, but let us suppose only half are seriously seeking spiritual information. That would still be about 70,000 to 81,000 per month! How many evangelists have the opportunity to teach that many people a month, every month? Even if the number of serious visitors should be only one third of the total, the number would be about 43,000. Considering these numbers, I feel a profound obligation to maintain, improve and expand this site. Would you agree we should do it? With that many people going on the site, one might think there would be, proportionately, more conversions. However, though much of the material on the site is evangelistic, and even larger part of it is for the edification of the church in general, as well as the preparation of teachers, evangelists, elders and deacons. It would be impossible to quantify the impact of the site on the church as a whole, but certain indicators lead me to conclude that a very substantial portion of the visitors are people who are already members of the church. At any rate, the numbers, evaluations and conversions convince me I should be spending most of my time on this method of evangelizing and edifying. Is my reasoning sound? One fabulous aspect of this Internet work is that I can carry it on anywhere I can use a computer and have access to the Internet. For example, when we made trips to Florida and Tennessee in June and July (See the last section of this report), I continued to work on the site. The “URL” of the site is www.editoriallapaz.org. -Daily average of visitors: 4,653. -Daily average of visitors: 4,408. -Daily average of visitors: 4,758. -Month of highest traffic on the site: October, 2010. -If activity holds at the present level, November will surpass October, but the holidays coming up usually mean less activity. -During the last three months, attendance has reached 115 once, and 118 twice. The average for Sunday morning is about 104. Normally, several visitors meet with us. -Baptized: Iris Delgado. This lady is about 37 years old, and has three children. Well prepared academically, Iris broke off a “live-together-without-marriage” relation to become a Christian. -The Bayamón congregation continues its support for benevolent and evangelistic work in the southwestern part of the Dominican Republic. Several members are also providing support, through the Clinton, TN church, for orphans or preacher students in India. -At the present time, my personal involvement with the Bayamón church includes teaching three classes. Of course, Rita continues her classes with the little children, both Sunday morning and Wednesday night. -In June, Rita and I spent two weeks with our son, Antonio, and his family, in Weston, Florida (near Ft. Lauderdale). Due to their transfer from Palatine, IL to Weston, Antonio had to delay a semester his studies for a Master’s degree with the Kellogg Institute. In order not to prolong those studies even more, he needed to take classes two weekends of June in Toronto, Canada. Complicating matters was the fact that his wife, Irelis, had had health problems for a year, and was scheduled for a four-week treatment in June. Antonio called us to come and help out, and we were more than glad to do it. We took good care of our grandchildren, Kevin and Kiara Karina! And helped out otherwise as we could. As of this date, Antonio has completed requirements for the Master’s degree, and will receive his diploma Dec. 11, in Chicago. Before that, he is scheduled to go to Israel, on a business trip for Motorola, Dec. 4 – 8. He invited me to go with him, and how I would have liked to, but several factors converged to make that not very practical. -Shortly after returning to Puerto Rico, my sister Joyce called to inform us that our mother, Virginia Shappley, was in critical condition in the Humbolt, TN hospital. Rita and I decided to leave without delay for Tennessee, and arrived in time to be with mother a week, before she passed away July 18. For one day of that week, mother was alert, indicated she recognized us, and seemed to be getting stronger. But, that night she suffered a relapse, from which she did not recover. She was ninety years old, and had been a faithful Christian from the time she was a teenager. Her gentle guidance during my formative years helped me to also become a Christian, and then dedicate my life to the works of the Kingdom of God. In West Tennessee, Rita and I had opportunities to visit with some of our relatives. -While in Tennessee, we visited our daughter, Sharon Laretta, and her family, in Shelbyville, TN. Then, back to Puerto Rico, where hurricanes can be a serious threat, especially in August and September. We didn’t have to wait long until Earl navigated over the seas toward us, becoming a large and powerful hurricane to the northeast of Puerto Rico. Fortunately for our island, it moved more to the North. Even so, the outer bands of wind and rain did considerable damage to Puerto Rico, particularly in the higher elevations, and that includes where we live and work, at about 1,300 above sea level. Limbs and trees down all over the place. Telephone and electricity lines down. We were without electricity for almost five days. There is a lot of bamboo on either side of the lane leading to our house, thirty to forty feet tall, with a thickness up to seven inches. About 30% of that was blown down, much of it in, or over, the lane. Clearing it out is a lot of fun! Razor sharp edges. A brown fuzz on the trunks which will drive you crazy with itch if it gets on skin or clothes. The first day after the winds died down, I cleared a way to get the car in and out. Then, worked little by little on what I could reach. Just recently, we had a backhoe pull down the higher stalks, and still have work to do to clear up all that! Incidentally, a stiff fine is levied for cutting down bamboo here under normal conditions, because the root system, being very dense, controls erosion. Meteorologists say Puerto Rico is having one of the rainiest years on record. -Then came the copper thieves! Three times, they have stolen sections of three or four telephone cables, about two inches thick, between the area where we live and the main station in the town of Aguas Buenas. It takes technicians three to five days to restore service. That complicates not only telephone service but also our work on the Internet site. About seven weeks ago, copper thieves ruined two of the air conditioners in this building where we work, and part of the electrical installation, plus the outside plumbing system, which includes a water pump, pressure tank and reserve tanks of water for the many times water goes off. Repairs and measures to check further damage cost about $2,000.00. Thankfully, the thieves did not get inside these facilities. The theft of copper in Puerto Rico has become a very serious problem all over the island. We now have one functioning air conditioner in this facility. During most of our “winter” season, not even it is needed. -Through it all, Rita and I continue to be blessed in so many ways, including with the health and strength –most of the time- needed to proceed with what we normally do, and for all those blessings we are deeply grateful. Not the least of them is what a number of you still do to make our life and work here possible. Your contributions and prayers are very, very much appreciated.